Can you ever imagine a cow using a toilet? 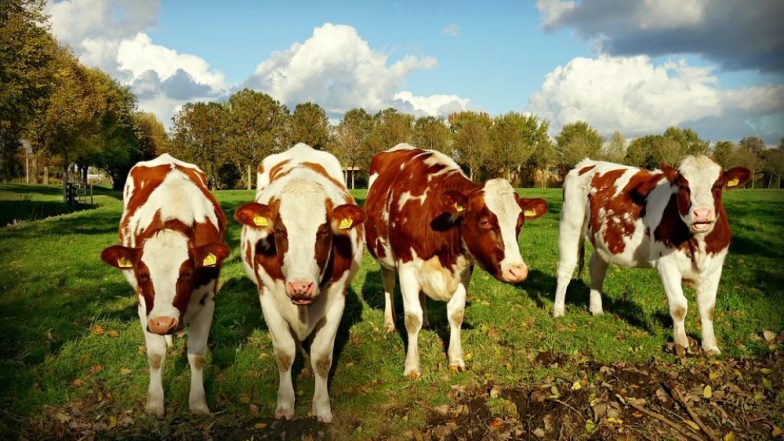 While that may sound bizarre to you, a Dutch inventor has developed a 'cow toilet' to reduce the pollution caused by cow waste. The aim is to cut emissions caused by a cow at the source itself, which results in environmental damage. The cow toilet is a device which collects around 15 to 20 litres of urine produced by an average cow per day. In the Netherlands which is the world's second-biggest agricultural exporter after the United States, huge amounts of ammonia are produced on a daily basis. AFP quoted Henk Hanskamp, the inventor of 'cow toilet' as saying, "We are tackling the problem at the source." He said, "A cow is never going to be completely clean but you can teach them to go to the toilet." The urinal is a box placed behind the cow while the feeding trough is placed in the front of the animal. After the cow finishes eating, a robot arm will stimulate a nerve near the udders, making it want to urinate. Cow Declared as 'Mother of The Nation' in Himachal Pradesh as BJP-Ruled Assembly Passes Congress' Resolution. Currently, cow toilets are being tested on a farm near Doetinchem towns in the Netherlands. Around seven of their 58 cows have learned to urinate when given a the urinal without stimulation. Hanskamp has collected thousands of litres of urine in this manner and stored it in tanks. He said he plans to look for start-ups willingly to put these raw materials to use. As early trials have proved successful, Hanskamp plans to make available cow toilets in the market by 2020. In the UK, 10 percent of greenhouse gas emissions are caused by agriculture. Cow uring produces greenhouse gas nitrous oxide which gets mixes with soil and manure. Ammonia can also result in pollution when it enters the water system and promotes the growth of harmful algal blooms.